Ukrainian Armed Forces incurred no casualties in ATO zone yesterday. Overall, Russian proxies committed 23 ceasefire violations. “In most cases, Ukrainian servicemen opened adequate fire in response to stop hostile provocations,” reported Col. Oleksandr Motuzyanyk, Ministry of Defense of Ukraine spokesperson on ATO, at a press briefing at Ukraine Crisis Media Center. Militants were the most active in Mariupol sector yesterday. In total, illegal armed groups attacked Ukrainian positions ten times using no heavy weapons. “At about 01:00, the enemy twice attacked our positions near Talakivka using small arms and large-caliber machine guns. Subsequently, Russian proxies attacked Lebedynske and Shyrokyne with small arms,” Col. Motuzyanyk said. The sector was relatively calm from 10:00 to 16:00; at 17:00 militants attacked Pavlopil and Vodiane using IFV weapons, hand grenade launchers, and small arms. In Luhansk sector, militants violated the ceasefire eight times. In almost all cases, Ukrainian soldiers were forced to open fire in response. Militants became active after 16.00, when they attacked Novooleksandrivka with anti-aircraft mount, automatic grenade launchers, and small arms. “Militants continued aimed fire for almost 90 minutes. Ukrainian military returned fire using grenade launchers and small arms,” added the spokesperson. Later, around 18.00, militants focused fire near ​​Popasna and Krymske. Militants also conducted small arms provocations near Krymske and Lobacheve. In Donetsk sector, militants conducted five aimed attacks. Each time Ukrainian troops returned fire. The hottest spots were Avdiivka and Zaitseve, where armed provocations began in the afternoon. “At around 16:00, the enemy used anti-tank grenade launchers, machine guns, and small arms against the defenders of Avdiivka’s industrial zone. Militants conducted fire from the direction of Yakovlivka and Spartak. 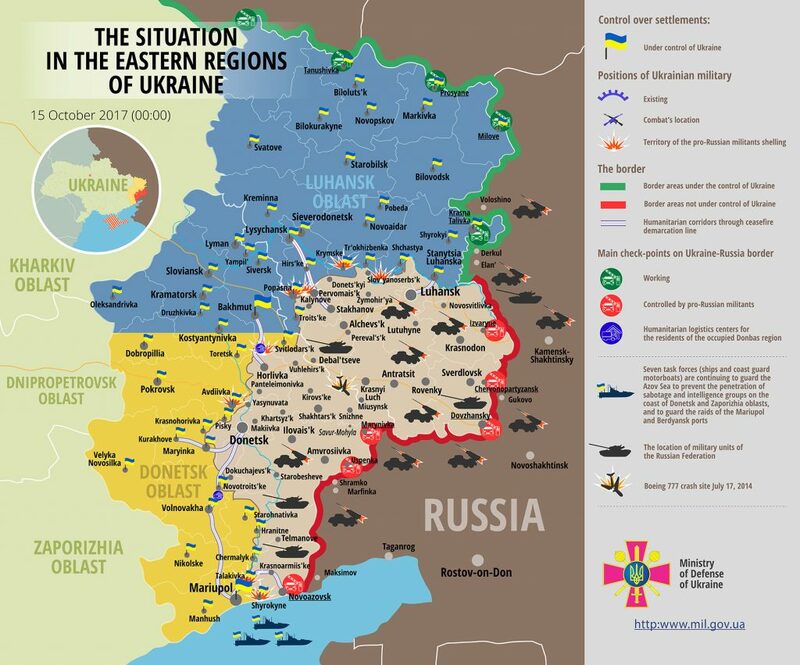 Our troops opened fire in response using weapons allowed by the Minsk agreements,” elaborated Col. Motuzyanyk. In Zaitseve, militants were attacking Ukrainian strongholds from 19:00 to 21:00; no heavy weapons were used. “Moreover, Russian proxies attacked our positions near Novoselivka Druha with small arms,” added the spokesman. The ceasefire held in Svitlodarsk and Donetsk airport areas yesterday. Report on the military developments as of October 14 is available here. Interactive data on the shelling: chronology shelling chart and the interactive map.